Deepika Padukone stepped out in style in a black tank top and tight leather pants with a hippie floral jacket from H&M x Kenzo with a oversized shade while she arrived at the airport with open hairstyle. She wore wore a black street style shoes and carried a leather bag. 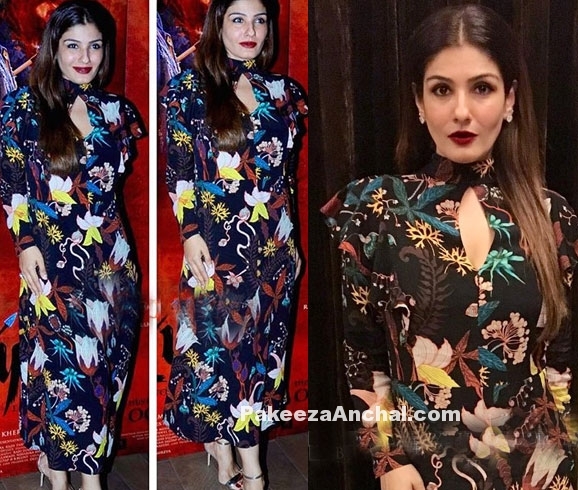 Actress Raveena Tandon wore a high collar cut-out dress from the Spring Summer staple. Raveena Tandon was seen after a long time during the screening of Mirzya. The cut-out printed dress was designed by H&M. She was sported in this bright autumn colors and was styled by Surina. She had completed her looks with dark red lips and mid parted hairs black heels. Anushka Sharma looked pretty dressed in all black with lace blouse and black striped pants designed by H&M at Jitesh Pillai’s party. She looked pretty simple with a pair of strappy sandals along with open hairstyle. Jacqueline Fernandez looked super in this adorable outfit in a mesh top Blue shirt and H&M red Silk draped skirt during the launch of it Indian Store in Delhi. She wore a full sleeved top along with black high heels with red lips. H&M is a Swedish brand opening its first Store in India in Delhi Select Citywalk mall. Bollywood Actress Sonal Chauhan wearing a Black and White Polka dotted short skirt. She looks like just a school girl paired it with a pink sneakers with side swept hairs.’Jannat‘ Fame Actress Sonal Chauhan is rocking Tollywood with her slim figure and charms.